"Brush off the negative stuff in your life and keep on praying," says Enchong Dee. The Coca-cola Ambassador, Enchong Dee, was present when Coke and World Wildlife Fund (WWF) Philippines unveiled their first billboard made from plants. Enchong and Kim Chiu, both Star Magic talents, were appointed Ambassadors of the softdrink brand known for its tagline, "Live Positively." Enchong has been the brand's ambassador for two years now. "I think it's a privilege, kasi every year, they renew my contract and they never stop giving back to the society... Kasi nga parang ang dami-daming nangyayari sa bansa natin and these are the things na maganda pakinggan, and magandang tignan," he said. BE POSITIVE. 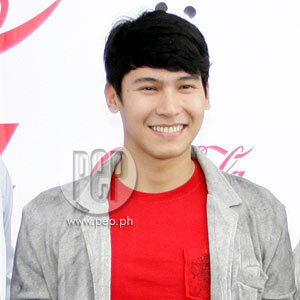 Enchong has a busy and exhausting schedule, yet he is able to manage it all by having a positive attitude in life. "First, you have to take care of the physical aspect of your life," he said. Enchong's first love is swimming. Before he entered showbiz, he was very passionate about the sport. He was even part of the Southeast Asian Games (SEA) in 2006. "Second, brush away all the negative stuff in your life and never stop praying." Enchong advises everyone, especially the youth, to be positive no matter what. And the best way to be positive is to do something for Mother Nature. "It's time to give back to the environment kasi nga, 'di ba, global warming? I think it's important to take care of the Earth."